We constantly get emails from brides and grooms saying, "I can't believe my wedding guests are doing this!" It's not surprising; many wedding guests are blissfully unaware of both etiquette and the mistakes they're making. Here are tips for both the wedding guests and the happy couple on how to avoid these common blunders. Yes, this is by far the biggest mistake wedding guests make. No matter how you word the RSVP cards, no matter how nicely you ask, some guests just never RSVP. Some assume that the happy couple knows that they're coming. Others don't send regrets because think they only need to respond if they will be there. Many don't realize how much depends on getting an accurate headcount on time. And still, others are forgetful or just inconsiderate. Send back the RSVP card on time, even if you've verbally told the couple, or sent an email. Engaged couples have so much to keep track of and they depend on getting those response cards. Even worse is when the guest list is being managed by someone else—like the mother of the bride—or when there are multiple events to keep track of. If your wedding guests haven't RSVP'd, it's time to hit the phones. You, your family, or a member of your wedding party can call the offending guests. Let them know your firm deadline for a reply; after that, you'll have to assume they're not coming. Really, any adult shouldn't have to be told this. Yet wedding guests continue to make this mistake: RSVPing "Yes" and then not showing up. When you say you'll attend, you're included in the head count for the caterer, meaning the hosts have to pay for you whether or not you're actually there. Also, you're creating an embarrassing gap at your table, making the conversation more awkward for the guests who did what they'd said they'd do. If you unexpectedly can't make it, call the hosts right away to apologize profusely and explain your circumstances. And of course, be sure to send a wedding gift. If you have no-shows, let your caterer or wedding coordinator know ASAP. If there's more than one table with guests missing, it's possible they may be able to seamlessly combine tables. After the wedding, you can say to the AWOL guest, "When we didn't see you at the wedding, we were worried. Is everything okay?" Once you've made sure that neither a natural disaster nor grave injury was the reason for their absence, you can then say, "I was really disappointed that you weren't there. It felt very disrespectful." You may not get the response you want, but at least you'll have said your piece. An open bar at a wedding is an invitation for some to drink all night, and then act like a drunken fool. Though the hosts want their guests to have fun, some people take it too far. 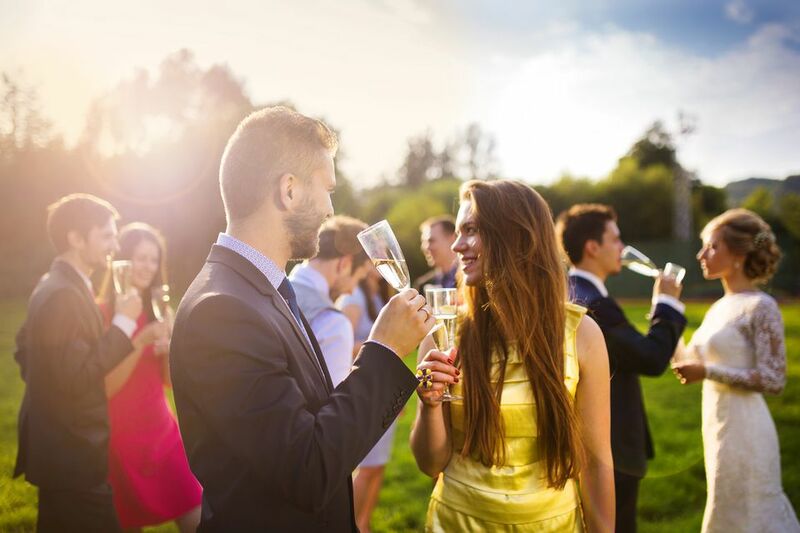 If you have a drunken guest at your wedding, it's more than okay to ask your bartender, wedding coordinator, or a trusted friend to call a cab and make sure the offender doesn't drive. It can be hard to ask someone to leave, but it's the right thing to do. We've all been at those weddings where a guest is stealing all the attention by wearing something ultra-revealing, giving a spontaneous (and unrequested) wedding toast, or breakdancing in the middle of the floor. Sometimes it's because they've been drinking, but sometimes it's just that these attention hogs want to be the star of the wedding day. It's fun to be the center of attention. You might think, "Wow, this wedding is boring. I should liven it up." But it's possible the couple is quieter and wants a more introspective occasion than you would. They've spent months planning this event; don't spend minutes undoing it all. If it's your wedding day, first you should know that it's very hard for anyone actually to upstage you. All of those people are gathered there because they love you and can't wait to witness your special day. If someone is drunkenly singing along, or doing the worm on the dance floor, most people will remember it as but one detail of a day all about you. No, you won't have every guest's attention 100% of the time, but that's normal. If some unplanned hijinks are happening on the dance floor, your DJ can switch things up with a slower song, or interrupt with a ritual like cake cutting. Best of all though, is for you to be as relaxed and entertained as the rest of your guests will be. Like the age-old axiom says, "Don't sweat the small stuff. It's all small stuff." One of the trickiest parts of making a wedding guest list is deciding who gets to bring a date. Though some couples' budgets allow all single guests to bring a date of their choosing, most couples don't have that luxury. If you're invited with a plus one, your invitation will state that explicitly: Jane Doe and Guest. Don't see those words? Sorry, you're just going to have to make friends at the reception. No worries, it's usually not difficult. Of course, if you'd rather not attend without a date, you have the prerogative to decline the invitation. If you really think they've made a mistake—ie, they didn't realize that you were engaged or living together, or how serious your relationship is, you can politely ask one time. But what you can't do is ask your hosts to make an exception for you—to do so is to ask them to insult their other guests. If your wedding guests have sneakily changed their RSVP card, you'll have to deal with the situation head-on. Hopefully, you've made an across-the-board rule and applied it equally. For example, we're inviting all spouses, fiancés, and live-in partners. All other guests are invited solo. That way when you need to confront someone, it's not personal. Call them to explain the circumstances, and let them know that your space and/or budget mean you can't accommodate their guests. Apologize for the misunderstanding, and be sure to tell them that this rule applies to all guests. Emphasize that you hope they'll still attend solo. It's a couple's nightmare—suddenly a guest has grabbed the microphone and is commanding the floor while he tells an embarrassing, rambling story in the guise of a wedding speec. They may have had too much to drink, be seeking attention, or just be inspired by the groundswell of emotions. It should go without saying that unless you've been specifically asked to, don't grab the mic at a wedding reception. Instead, write the couple a heartfelt letter, or toast them at a different event. And If all of the obvious reasons why this is a bad idea don't stop you, think about your reputation: You'll forever be the guy who tried to ruin your friend's wedding. That's going to be hard to live down. Prevent this from happening by asking your wedding band or DJ not to give the microphone to anyone who's not scheduled to give a toast. If it happens anyway, get the DJ or band to start the music up and cut off the misguided tribute. White, cream, bone, ivory, ecru- unless you're a J.Crew catalog, they all mean the same thing, and a wedding guest shouldn't wear them. Yes, it's true that not all brides wear white. And yes it's true that some brides, like Kim Kardashian, even ask everyone to wear white. But at most weddings, the woman wearing white is the bride. When anyone else wears white, it seems like a plea for attention. This is a singular day you can let your loved one have color all to herself. Even if she's not wearing white, do you really want to be that tacky guest who looks like she's trying to upstage the bride? If a wedding guest asks you if you mind them wearing white, you're then put in the position to be either a pushover or a bridezilla. Strike a middle note by saying, "Well, if it's really the only thing you have to wear, it will be fine. But truthfully, I had envisioned that I'd be the only one wearing white that day. You wouldn't want anyone to think that you were the bride, would you?" When traveling to an unfamiliar city, guests sometimes expect the couple to be their personal assistants. They ask repeated questions about where to stay, what to wear, and what else they should do while they're there. Some even expect that you'll hang out with them the whole time they're in town. If you've never planned a wedding, you might not understand how it feels when 150 people are making these demands on you. Look for their wedding website, or talk to a close friend or family member. Know that attending their wedding means you'll probably only see them at pre-planned events; instead, plan a separate trip for hangout times. You can avoid many of these questions by creating a full wedding website complete with details for each event, FAQ on what to wear, and local sightseeing opportunities. If your wedding location is close to many hotels, you might find that booking a block of rooms won't actually save your guests any money. However, doing so will help avoid those "where to stay" questions. This one might surprise you, but couples probably don't want guests wildly tweeting about their weddings. Though public support of them and their relationship is awesome, talking specifically about the wedding might cause hurt feelings or injured egos to those who weren't invited. Worse is when guests live-tweet the wedding itself. They should be paying attention to the amazing event happening before them, rather than their phones. 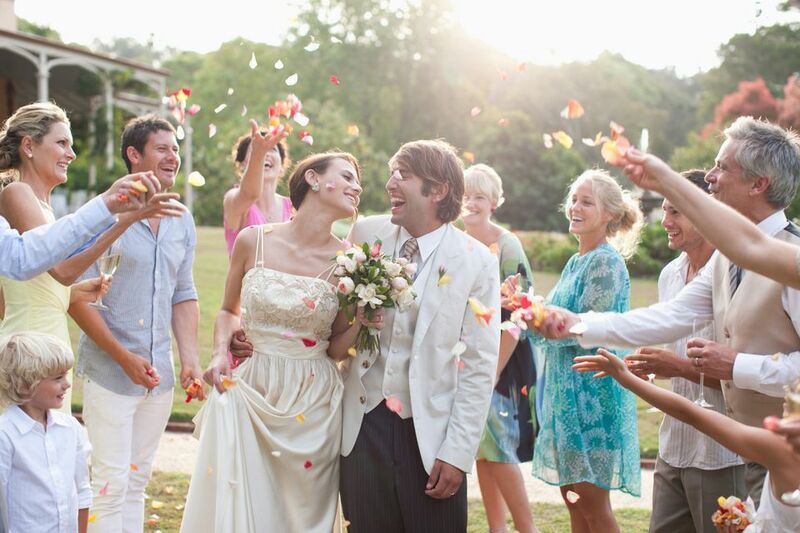 No one's trying to deprive you of the fun of reliving a wedding. It's easy to create private groups or lists on Facebook and filter your posts to appear only to those people. Post photos also with a limited filter, so that they are only seen by those tagged in them. On Twitter, Tumblr, or public Facebook posts, stick to simple congratulations such as, "Congrats to John and Jane. I know a lifetime of happiness lies before you." To keep things private before the wedding, create a Facebook group of wedding guests, and set its privacy settings to "secret." Tell guests that this is the designated place to find ride shares and info, and where to post wedding-related pictures. You'll also want to turn on tagging approvals. This will not only protect other people's feelings but also prevent your boss from seeing those questionable photos from your bachelor party. Pictures of some wedding ceremonies tell an interesting tale: Processional photos show several empty pews that are suddenly quite full by the time of the recessional! Wedding guests don't always allow enough time for parking, finding the venue, or traffic. It's an unspoken etiquette rule that one should try to be fifteen minutes early for weddings, baptisms, funerals, and graduations. These are not times to be "fashionably late." Rather you want to allow time to socialize before making sure that you have the best seat for viewing your loved one's important moment. If you can budget the time, it's a good idea to start five to ten minutes late, especially if parking is difficult. Have your wedding coordinator or an usher keep an eye on the arriving guests so that they can let you know whether the majority have arrived. If someone is late, be the gracious host and don't make a big deal of it. Yet if you only have a short window of time to be in your ceremony space, start when you need to. Being able to not rush your vows is more important than your perpetually late guests.